The Mount Panorama circuit in Bathurst, New South Wales is incredibly tight and complex as it winds its way to the top of the mountain, with long straights and sweeping curves down the other side. It takes a serious level of concentration, skill, and luck to put in a blistering lap time there, as well as a really good car. The prior lap record, a 1 minute 59.291 second lap, was set by Christopher Mies in a de-restricted Audi R8 LMS Ultra in November of last year. That time is already more than two seconds clear of the GT3-class pole winner for today’s 12 hour race. In fact, it is faster than Formula 3 and Formula 5000 cars that race at Mount Panorama as well. 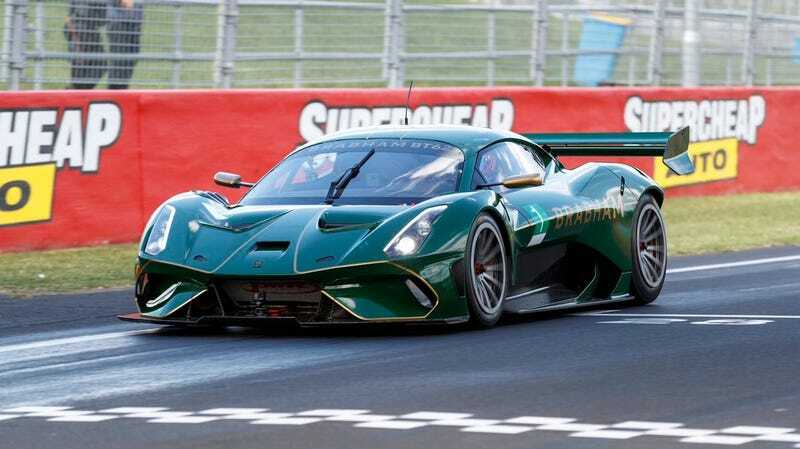 Saturday afternoon local time, Brabham driver Luke Youlden smashed the record by a massive six tenths of a second, putting in a 1 minute 58.68 second lap. That the BT62 is already faster than a wild factory-supported GT3-spec Aston Martin, Porsche, Mercedes, Ferrari, or Bentley is in itself a success. To have set the outright lap record at such a nutty circuit, however, is deserving of applause. Now that that’s out of the way, are the 3172 people who gave nearly $400,000 to David Brabham’s 2014 Indiegogo campaign for a WEC LMP2 effort happy with their money being spent on this instead?